I have had gardens in the past. In fact, every year since we moved to Indiana until I had Kayla I had a garden. Isaac loved gardening with me. Here is a post kicking way back showing Isaac with some of our garden treasures. That year I had Kayla I was too tired to do a garden. But now she is at the age where I knew she would love gardening with me. So I decided to do raised cedar beds. I started out small with only 4 cedar boxes. I figured if I set myself up right even if I had to take a break for a year the beds could sit empty and still look halfway decent in our yard. Or I could always do a fresh cut flower garden the next year. We will see. The key is I wanted flexibility. Doesn’t it look pretty? I got all of my cedar fence posts at Lowes. They were $1.95 each at mine. So each box cost about $11 in wood. If you decide to make these I highly suggest using a nail gun to tack a few nails in to temporarily hold them in place while you drill the screws in. It was my saving grace. Step 1: Rent a rototiller to loosen up the soil and get the ground level. Our Ace Hardware rents them for about $26 for 4 hours. My honey helped put my garden in for Mother’s Day. He even had a good attitude – bonus! Step 2: Lay down some black landscape cloth to keep any weeds from growing through. Make sure to overlap the cloth. Step 3. Edge your garden in cedar posts. 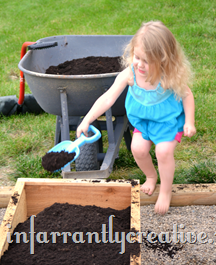 Step 5: Grab a little garden beauty girl (see above picture) and plant your fruits and vegetables. We added a little Whitney Farms Organic Plant Food to each bed as well. So I am still a newbie gardener do you have any advice? Disclosure: As part of the Lowes Creative Blogger Team, Lowes provided me a with a gift card for purchasing my garden supplies. This is a repost from May 2012.